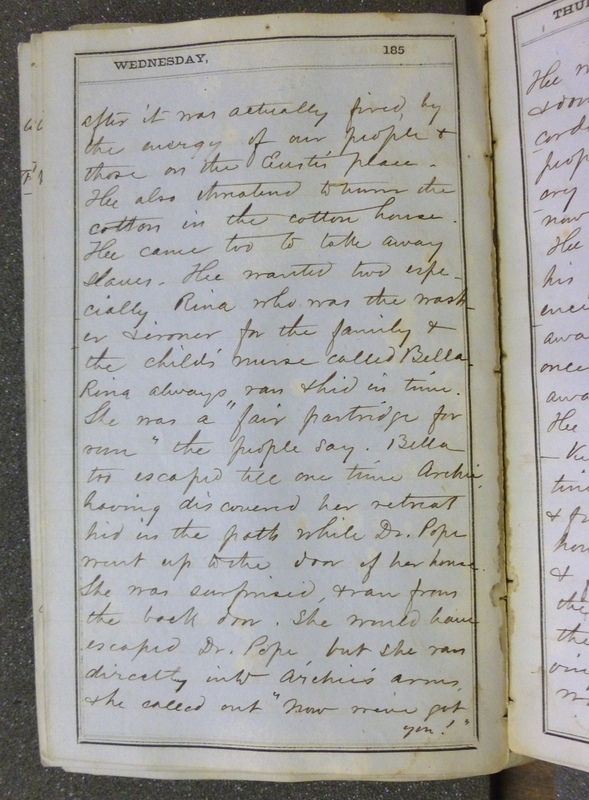 Image description: Entry, dated 23 August 1862, from the diary of Laura Towne. Towne (1825-1901) came to St. Helena as part of the Port Royal Relief Group of Pennsylvania, an abolitionist group that came to Beaufort, S.C. and the surrounding Sea Islands after the Union Army seized control of the area in April 1862 and slaveowners abandoned their property and enslaved populations to flee to Confederate forces. The Port Royal Relief Group came to help educate the formerly enslaved community on the islands, and Laura Towne, along with her colleague Ellen Murray, played an integral role in founding the Penn School on St. Helena Island. 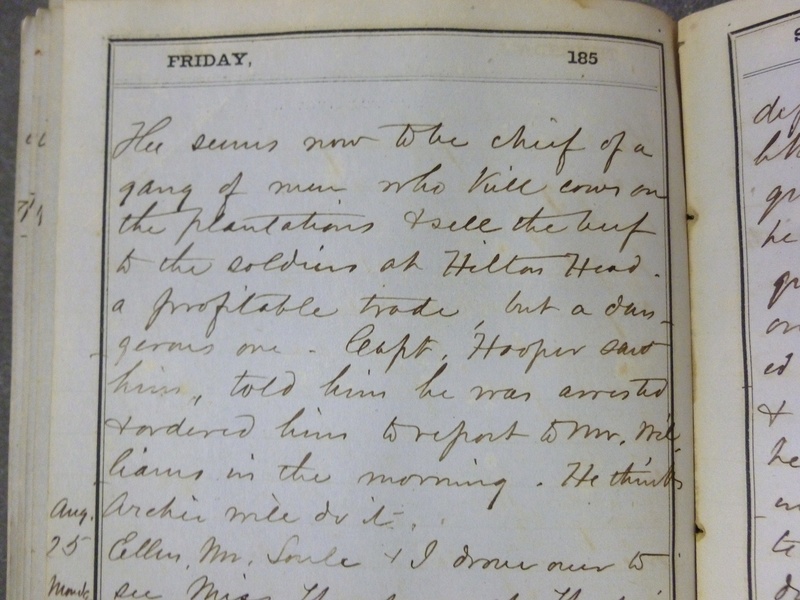 Towne wrote frequently in her diary, including descriptive details about the African American community on St. Helena and around the Sea Islands, the establishment of the School, relationships with Union Soldiers, and hostile relations with Confederate soldiers and sympathizers. Image citation. Folder 335a in the Penn School Papers, #3615, Southern Historical Collection, Wilson Library, University of North Carolina at Chapel Hill. Captain Hooper had to go to-night to arrest Archie for killing cows. This Archie, or Archiebelle, as the people call him, is Susannah’s eldest son. He was married to Madeline, or “Sarah’s Perry’s”, by Mr. Pierce, the night I arrived at the Oaks. He has not treated his wife well. 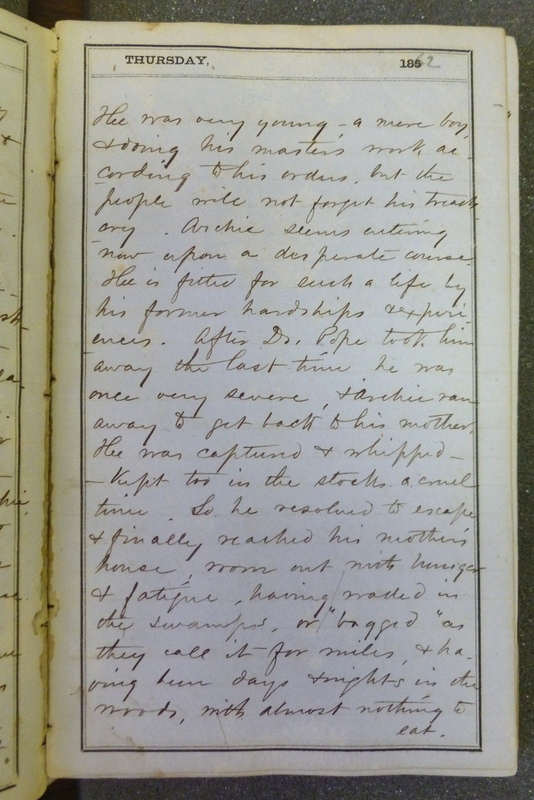 He volunteered in Hunter’s regiment and deserted several times but was forgiven. Hunter did not even punish desertion severely, for two reasons. He had promised the people pay for their services as soldiers and he could not keep his promise, and he thought the men did not yet understand the stringency of military law and should be excused till more used to it. Archie went by the name of Baltimore Chaplin and was so able and intelligent that he was made sergeant. He was Dr. Daniel Pope’s bodyservant or peculiar boy, and had rendered him a service that made the people at the Oaks hate him. 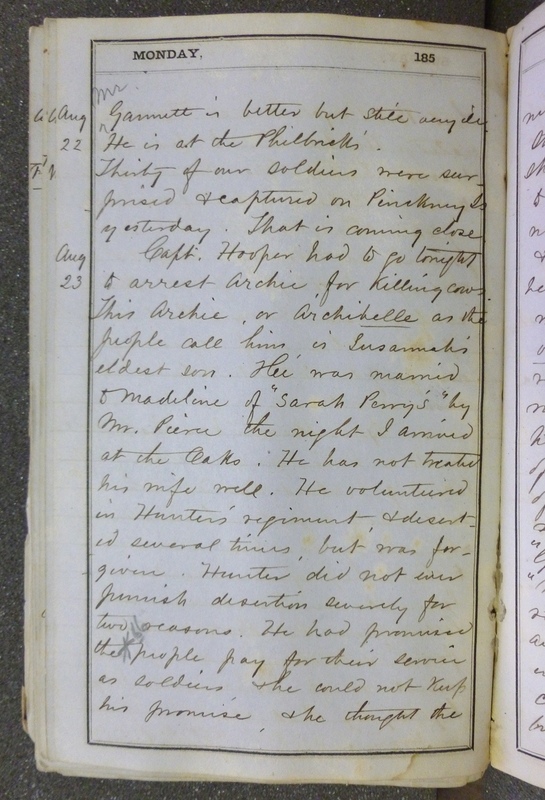 After the flight of the rebels at the taking of Hilton Head, which the negroes always call the “Gun Shoot at Bay Point”, “Ma’ Dan,”or Master Daniel, returned several times to take away clothing, corn, and poultry, – indeed, all the provisions he could carry, and to burn Eustis’ bridge – an intention frustrated, after it was actually fired, by the energy of our people, and those on the Eustis place. He also threatened to burn the cotton in the cotton-house. He came too, to take away slaves. He wanted two especially – Rina, who was washer and ironer for the family, and the childs nurse called Bella. Rina always ran and hid in time. She was a “fair partridge for run” people say. Bella, too, escaped till one time Archie, having discovered her retreat, hid in the path while Dr. Pope went up to the door of her house. She was surprised and ran from the back door. She would have escaped Dr. Pope, but she ran directly into Archie’s arms, and he called out, “Now, we’ve got you!”. He was very young – a mere boy – and doing his master’s work according to his orders, but the people will not forget his treachery. Archie seems entering now upon a desperate course. He is fitted for such a life by his former hardships and experiences. After Dr. Pope took him away the last time, he was once very severe, and Archie ran away to get back to his mother. He was captured and whipped – kept, too, in the stocks for a cruel time. So he resolved to escape, and finally reached his mother’s home, worn out with hunger and fatigue, having waded in the swamps – or “bogged” as they call it – for miles, and having been days and nights in the woods, with almost nothing to eat. He seems now to be chief of a gang of men who kill cows on the plantations and sell the beef to the soldiers at Hilton Head – a profitable trade, but a dangerous one. Captain Hooper saw him, told him he was arrested, and ordered him to report to Mr. Williams in the morning. He thinks Archie will do it. 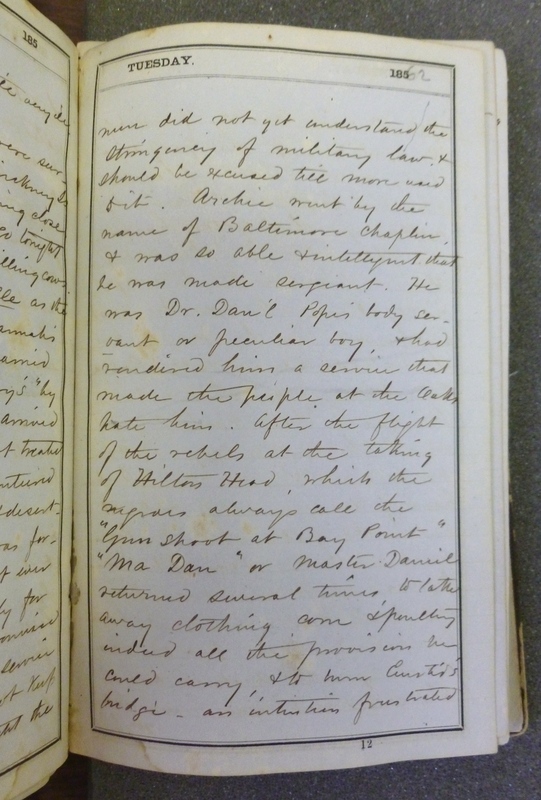 This entry was posted in Southern Historical Collection, Uncategorized and tagged diaries, Laura Towne, Penn School, South Carolina, women. Bookmark the permalink.